SFO Museum is a fully-accredited museum… at the San Francisco International Airport. We have 20 gallery spaces located throughout the terminals with upwards of 1,300 objects on display at any given moment. We’ve produced over 1,200 exhibitions on topics such as Italian motorcycles, lunchboxes, Russel Wright, duck decoys, the fashion designers of aviation uniforms, and California’s natural history. We have a permanent collection of over 130,000 objects related to the history of commercial aviation. We have an aviation museum and library in the International Terminal, itself an architectural interpretation of the Airport’s 1930s passenger lobby. We care for the 100+ objects in the Airport’s growing public art collection, which includes work by Wayne Thiebaud, Arnaldo Pomodoro, Jay DeFeo, Yayoi Kusama, and Amy Ellingson. We’ve been doing this since 1980. These are usually not things that most people think of when they think about going to the airport. We would like to change that. Sometimes people say to us: I’m at the airport… where is the museum? The answer is that the museum is everywhere inside the airport. That in many ways the airport is the museum. 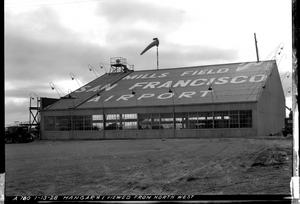 This website — millsfield.sfomuseum.org — is meant to serve two purposes. First, it is a place to consider what it means for a museum in an airport, an airport with over 55 million visitors in 2017, to operate in a world where (almost) everyone is connected to the internet. It is a place to learn what are the opportunities and what are our responsibilities, as a cultural heritage organization, to everyone who passes through SFO equipped with curiosity and a computer connected to the network? This is not an experiment or a labs project. It’s not even our official website. It is a work in progress to understand and to share the arc of our direction as we answer the question above. To determine where we are going, where all these technologies will take us, and to invite you along for the ride. We want to explore and to learn by doing, and we are confident that not everything will work – at least not on the first try. But we believe it is important to do this work in public, and as transparently as possible, so that you have the opportunity to tell us what you think and, in turn, to help us make everything even better. It is early days and this is a wide-ranging initiative, so there isn’t much to show yet. We are still putting in place the first building blocks to enable all of the things we’d like to do going forward. The second, more immediate, purpose for this website is a simple weblog where we can share broadly both the theory and the practice of what it means to be and what it’s like to operate a museum inside an airport. We do everything ourselves at the museum, from curatorial to registration to exhibition design and installation and now all things digital. The goal of the weblog is to be a place where everyone at the museum can share their work and the motivations that guide that work, and inform what you see at the airport. Some of it will be tangible and immediate, some of it may be shop-talk, and some of it may be speculative and aspirational. We hope that all of it will be interesting and give you a reason to discover a little more of the museum the next time you’re at the airport or visiting us online.